I'm looking for the costs of rolling stock during the Civil War. Pullman Palace Car? Dinning Car? Livestock Car? Boxcar? Etc. 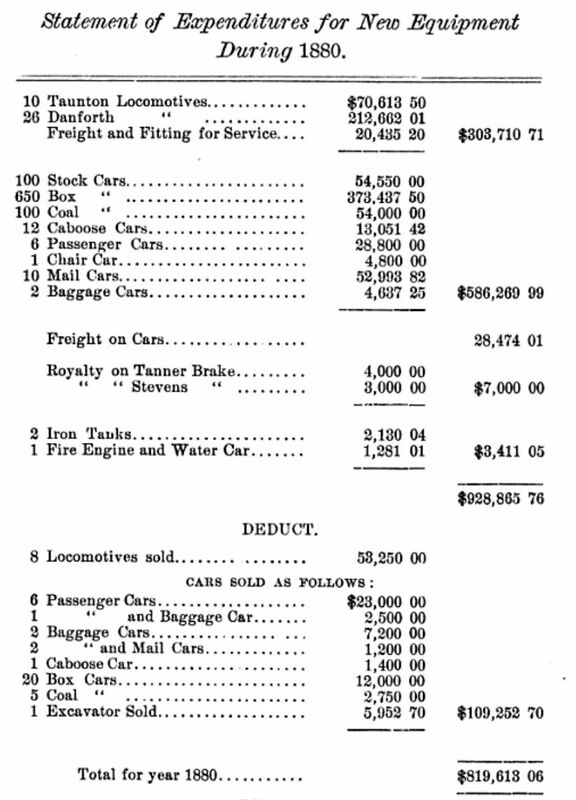 UPRR Stockholder Report, 1880, page 15. Closest report found to what you are seeking is the Report to the Stockholders of the Union Pacific Railroad, 1880 (see page 15). Thank you VERY much! That is exactly what I was looking for. Amazing how you could find that! Merry Christmas to me! I will try to make a donation soon. Great ... glad to help! There were no Pullman Palace or Dining cars during the Civil War... they came afterward. Off the top of my head, Freight cars were likely between $500 and $1,000 each ... platform cars being cheaper than box cars ... Passenger cars $2,000 to $5,000 depending on style (1st or 2nd class, baggage or coach). "By early October  the shipment of locomotive parts from New York to Panama finally commenced, and almost immediately problems developed. When Huntington first approached the Pacific Mail Steamship Co., he was quoted a price of 'about $2,000' per locomotive via Panama and told that they would take four engines per steamer. By the time locomotives were actually delivered to the wharf, however, the Pacific Mail's competition had ceased operation; the company now wanted $3,500 in gold per engine, and it would only take them 'as fast as they can.' To make matters much worse, rather than taking all the parts of the same engines, it took partial shipments of two or three different machines on each steamer. This meant that shop men in Sacramento had to wait for several shipments before they could begin erecting any of the locomotives." —Railroads Shipped by Sea. Railroad History, Bulletin 180, Spring, 1999. pp. 7-30. Thank you. My story is based in 1876, but the Civil War is still going on [fictional], and IIRC Pullman released his first cars in 1865, where can I find information on their ammenities/price? This is just for some fiction friends & I are writing for a game story, for fun. I have a passion for making it historically accurate though. Please help me locate this information, thank you, sir.